Lido - Lake Garda, Italy - Find and book the camping holiday now! Why not experience what can only be called one of the most unforgettable luxury camping experiences within all of Italy? 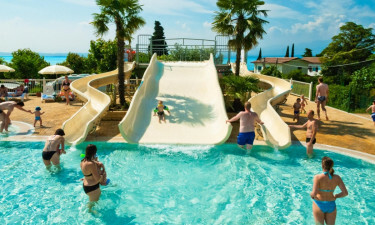 Camping Lido (Pacengo) is located upon the picturesque shores of famous Lake Garda. Found only 25 kilometres from Verona and nestled between many tranquil villages, this holiday camping site is able to address the needs of adults as well as children. It boasts agreeable weather, excellent views of the nearby countryside and cutting-edge facilities. LUX-Camp is more than pleased to address any additional questions upon request. Why should I camp at Camping Lido? Camping luxury is defined by much more than location alone, so guests will be able to experience all of the conveniences that they have become accustomed to. Some examples here include wireless Internet access within each mobile home (as well as throughout the site), facilities designed for handicapped visitors, baby changing areas and mobile home cleaning services. Camping Lido has made it a point to provide its visitors with a wealth of activities to choose from. Basketball, tennis, football (soccer) and volleyball on the beach are some popular choices. It is also a good idea to mention that aquatic attractions are just as accessible. Swimming, surfing, sailing and kayak rentals are only moments away. There are countless times when visitors will arrive with children during their camping holiday. Thankfully, this resort provides a number of options to keep the younger crowds entertained. Live entertainment is one exciting option. There is also an open-air pool specifically designed for children (professional lifeguards are on duty). This is always a welcome advantage when adults hope to sit back and relax, while knowing their little ones are in good hands. 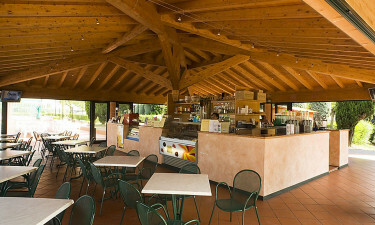 Camping Lido is equipped with a restaurant as well as a pizzeria. Local cuisine and international foods are both offered. Guests can choose to dine in, while there is also a takeaway service for anyone who instead prefers to dine on their pitch. A small bar is found within the restaurant. Patrons can select a pint of cold beer, a glass of tempting Italian wine or a tasty cocktail before venturing down to the shores of Lake Garda. All of these establishments are open throughout the peak tourist season. A small market is found within this luxury camping complex. Common items such as fruits and vegetables, fresh bread and ice cream can be found here. Swimming supplies and stationery are also offered. This market is open during the main tourist season.